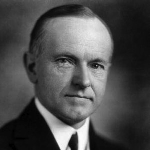 Calvin Coolidge’s Thoughts on the Declaration of Independence | What Would The Founders Think? Here are some thoughts from an underrated, and unappreciated President of the United States about the document that embodies what we celebrate on Independence Day. If this apprehension of the facts be correct, and the documentary evidence would appear to verify it, then certain conclusions are bound to follow. A spring will cease to flow if its source be dried up; a tree will wither if it roots be destroyed. In its main features the Declaration of Independence is a great spiritual document. It is a declaration not of material but of spiritual conceptions. Equality, liberty, popular sovereignty, the rights of man – these are not elements which we can see and touch. They are ideals. They have their source and their roots in the religious convictions. They belong to the unseen world. Unless the faith of the American people in these religious convictions is to endure, the principles of our Declaration will perish. We can not continue to enjoy the result if we neglect and abandon the cause…. About the Declaration there is a finality that is exceedingly restful. It is often asserted that the world has made a great deal of progress since 1776, that we have had new thoughts and new experiences which have given us a great advance over the people of that day, and that we may therefore very well discard their conclusions for something more modern. But that reasoning can not be applied to this great charter. If all men are created equal, that is final. If they are endowed with inalienable rights, that is final. If governments derive their just powers from the consent of the governed, that is final. No advance, no progress can be made beyond these propositions.